Today I wanted to share with you a look at my December Daily Foundation Pages for 2017. I don't do foundation pages in the same way that Ali Edwards does because I don't glue anything down until the day happens in case I want to make changes. I do however slip some products into the pockets so I have something to start with based on activities that I know are coming up. I purchased the Jasmine Jones album, the Jasmine Jones mini kit, as well as the Ali Edwards Main Kit. There was an issue with the Main Kit and instead of getting the whole physical Main Kit, I got pieces of it (just not the cards and papers) and the Digital Kit for Free. Ali's customer service team is on point with the craziness of the ordering period this year. I've linked the digital kits because the physical kits aren't listed on the website anymore. I am also using cards from LarkinDesign's Digital Kit, pieces from Merry Everything (my new mini kit), and some Sahlin Studios Digital Kit. Let's take a look at what I have done so far. For those that prefer it, there is a video linked down at the bottom that you can watch as well, but there will be more information under each picture. I forgot some stuff while filming my video last night! I am not usually a fan of gold, but I really liked this album! The second part of this cover page is just a simple piece of plaid 12X12 from Hobby Lobby cut down to a 6X8 and a white star from the Main Kit. On the left side of this layout I used a 2017 December Calendar that I made using a tutorial from Amy Gretchen! ((You can pick that up as a FREEBIE in my shop)). Right now I have a couple of things penciled in, but not much yet. I will add stuff in pen as the days pass. On the right side I used a tag that I created, inspired by a lovely lady in the Lawn Fawn Addicts stamp group on Facebook. I used the Mini Wreath Die and some colored card stock to cut out the wreath and the bow. I used some snowflake stamps from my stash and white heat embossed them on a tan tag. The Merry everything stamp is from a previous December Daily stamp set. I am considering using these tags for Christmas presents so I wanted to document them. The back of that tag just has to and from stamped on it. The right side of this spread is my Reason Why. The red 'my reason why' are from Ali, and I got her handwriting as a font from Creating Keepsakes. I used some wood veneer numbers from Hobby Lobby, colored them with various embossing powders, and put a strip of plaid washi tape behind that. I formatted the journaling in Photoshop (I am trying to do more in Photoshop to better my skills). The back of that 3X8 is just some plaid paper from my stash. The right side of this is a cut file from Cathy Zielske that she made thanks to the Product Play class this year. My Silhouette isn't working right, so I just printed the file on some regular cardstock and cut around the half circle edge. If the machine is cutting right, the white parts aren't supposed to be there and you can back it with whatever you want too. I really need to figure out why my machine isn't working right. I have left the back of that half circle blank for now. I might add some journaling or some patterned paper or even a photo to it as the month progresses. Alrighty, so I'm going to plug it yet again... if you aren't taking the Product Play class... you really should consider it! It was absolutely amazing and chalk full of ideas. As far as I know it is still open for purchase. In the Circles with Pam lesson, Pam Baldwin does this cool thing with a folded piece of paper and some pictures. I am hoping to recreate it with my own spin to document my Christmas tree. On this same layout, I can also document some ornaments that are special this year if I keep a layout similar to Pam's. Here I am just showing you one of the cards that I printed out from the LarkinDecember Digital collection. I don't know what story I want to use it for, but I love this floral wreath and definitely wanted to make sure it got used in the album. I just covered the empty pocket with some card stock to try to prevent glare. The top left card of this spread is one of the cards that will be released in my mini kit coming to the shop soon! The card at the top of the left side of this spread is from my kit as well that I want to use to help document Christmas baking! The Merry card on the bottom is part of the Black and White card set. The bag on the right side is just a bag from Recollections that I picked up from my local Michaels last year. On the right side of this layout I have a 2X2 pocket page protector. I want to take a leaf out of Ali's book (or was it Amy?) and use these pockets to kind of document things around the house. The red felt heart and white star both came from Ali's Main Kit while that silver ornament came from a Project Life Holiday Mini Kit. I don't know if that ornament is going to stay, but I like it for now. The right side of this spread is a gold foiled tag that came from the Main Kit and I want to use it to help me document my holiday playlist! I will write (or print) my holiday playlist on the back of the giant tag and the right side is just a 4X4 pocket protector that has some music patterned paper in it. The left side is blank for either a photo or a story or whatever else I decide to put there. 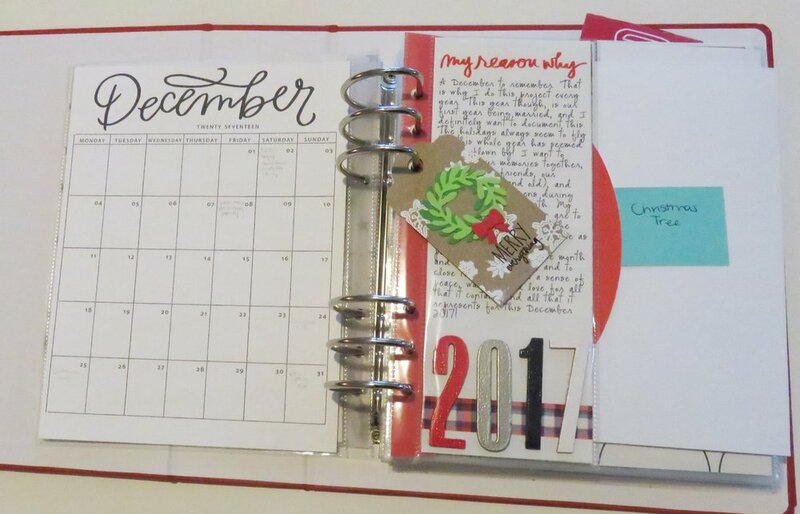 The right side of the layout is going to be used to document December 15th. This is the launch party for the music magazine I work for and we're super excited about this. Bonus is that my husband actually gets to play in this show. I used a card from the Black and White card set and a cork number from the Main Kit (you can buy the digital kit here). I haven't done anything with the left side of the layout yet, and the card in the top is the back of that one from Day 15 from the Black and White card set. The right side is just a transparency from a past kit that is gold foiled. After that I have just a couple of cards for when family comes into town. My husband and I will be hosting Christmas at our house this year (since our roommate moved out earlier this year) and we're pretty excited. It makes me giggle when I realized that the back of both of the cards from the previous spread both involve trees. The pink one is from the Jasmine Jones mini kit and the bottom one is from the Black and White set. After that I included a cool quote card from the Jasmine Jones mini kit. I plan on using a Starbucks bag to hold a story, but I don't know which one yet. On the right side I took another leaf from Ali's book and decided to do tags in the pocket. I printed this template (scroll down through her foundation pages until you see it) out on heavy duty cardstock and backed it with some plaid patterned papers and used some shiny red alphas to denote which one is for my husband and which one is mine. For now I am just leaving them in the pocket until I decide whether or not I want to leave them there. I may or may not make some for family when they come into town, I haven't decided yet. It also depends on when they get here. The last thing that is in my foundation pages are some cards for Christmas Eve. I made these cards, you can find the date card here and the merry and bright card will be in my shop this week. I don't know if I want to stop at Christmas Day or go further. It all depends on family and what is going on. Here is a video flipthrough of my album. There are some pages that I didn't show here because I have made changes since I filmed this video yesterday. Enjoy! Thank you so much for stopping by and checking out my December Daily Foundation Pages. Make sure you grab that freebie mentioned above (if you like Monday start calendars).